“Mana! Hurry up! We’re waiting on you!” Ma called for the third time that day. Mana didn’t want to go. She hated leaving Terror Mountain. She hated going up to the Virtupets Space Station. A whole week they were going to be there. She dreaded it every year. “Sis! Hurry up!” yelled Mana’s little brother the magma Bori, Skippy. “Come on! I’ve never been there before!” the lab rat Azure added. “Just a minute! I’ve gotta find Archie’s collar!” Mana the Christmas Bori replied. She knew perfectly well where Archie, her little now brown zomutt’s collar was. 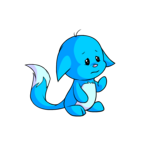 Archie used to be faerie, but then Ma went to paint Azure’s petpet and painted Archie instead. Mana had a hard week getting used to Archie’s appearance. She still looked for the fluttery zomutt following her. Mana pushed open her out swinging door and hit Skippy with a hard bang. She unhooked her sweatshirt from a hook on her wall and wandered downstairs with Archie on her heels. Archie shook her brown fur and wiggled her four ears. She chased after Mana down the stairs wondering why Mana hated the Space Station so much. Archie could just remember the many stenches that seemed so inviting at Grundo’s Café. Mana looked drearily out of one of the Space Station’s many round windows. She pulled Azure out of a doorway that was about to close and pulled him down the hall after Ma and Skippy. Skippy’s snow weewoo, Lunch was riding on Archie’s back. Riding on Archie was convenient for Lunch now that Archie didn’t have wings. Mana wondered how Lunch, the snow weewoo, could be so happy with a name like that. “Here we are!” said Ma as she unlocked the door to the room they were staying in. “Home away from home. Ma, this is room number 754. We stayed here last time,” Mana complained. Azure ran to the window and sat in the window seat, staring out of it. Skippy pushed open a door to one of the rooms leaving his bag in it. Claiming it for his own. “Why don’t you go see what is new in the Station?” Ma suggested to Mana and Skippy. “Ma! This is one of the most un-updated places. TNT never seems to add anything here,” Mana mumbled. “Just go! Take Lunch and Archie with you,” Ma said, her eyes wide with criticism. Archie looked around the station while she was following Mana and Skippy. It had been changed since the last time she had been there. Lunch was growing heavy on her back. But she was glad that Lunch was a semi-real petpet now. He was a Christmas pile of soot. But now he was zapped by the lab ray. It was Lunch’s first time in and last time. He was really lucky to be zapped into something so pretty on his first try. Most other petpets don’t have that luck. Mana stopped by the Adopt-a-Grundo desk. A Christmas Shoyru ran up and flung herself against the desk trailed by a Christmas Aisha, a cloud Xweetok and a camouflage Kougra. “My little Hamish has disappeared! What will I do!” wailed the Shoyru. “Now Chika, please, don’t throw yourself against every employee at this station in despair!” the Aisha said soothingly. “Let’s get her back to the room, Moon. Maybe we can think of something to do about her,” said the Kougra. “Flight, don’t just stand there; help me move her!” cried Moon. The Xweetok stood quaking with fear. “Do you need help?” asked Mana. Skippy dropped Lunch, who wailed at the impact of the floor and the issue of losing his tail branches again. “Oh, could you?” asked Moon. “Sure,” Mana replied casually. Mana, Moon, Flight and the Xweetok pulled Chika off the desk and away from all the onlookers. “What are you lookin’ at!” snarled Flight. “Oh, Flight, please, don’t make a scene,” said the Xweetok timidly. “Tiger! Some lot of help you are!” Flight turned and pushed sobbing Chika down on the nearest bench. Tiger cringed at her sister’s harsh words. “But we call her Flight,” chimed in Tiger. “This is Tigerstripe, or just Tiger and... Chika,” finished Moon. “So, who is Hamish?” asked Skippy, picking up Lunch and putting its tail back on. “Hamish is Chika’s cherished biyako,” said Flight. “Oh, okay. By the way, I’m Mana and this is Skippy,” said Mana. “Oh, I just love weewoos! Too cute! His name?” asked Tiger. “It’s only 10:20am!” said Tiger. “His name is Lunch,” said Skippy. “Oh, ewww... Um... okay,” mumbled Tiger. “ARCHIE! Come! NOW!” called Mana. Archie trotted up to her with a piece of garbage in her mouth. “Awwww... Archie is cute!” said Flight. “Come with us!” said Moon. Archie looked at Lunch, and attempted to bowl him over. Lunch fluffed himself and took a flying leap onto Archie’s back. Archie tried to fling off Lunch, but to no avail. Finally Archie ducked under the footrest on a chair and knocked off Lunch. Lunch sat up abruptly with only one rock for an eye instead of two. “That sounds like tons of fun, so maybe you will enjoy yourself up here this week!” Ma said. “I hope so, but I would really like to find Hamish,” said Mana. “Okay. 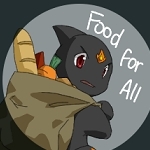 Have fun,” Ma said, picking up her shopping basket as she left to go to the weaponry and armory shops. Skippy picked up Lunch and its rock eye and put it back in Lunch’s head. “Hey, so what do you know about Hamish?” asked Azure. “Done with your star-gazing?” retorted Skippy. “Not much. Except Hamish is really small,” answered Mana as she hit Skippy on the back of his head because of his comment. “Oh, can we head to the Recreation Deck?” asked Azure. Here they went again. Archie didn’t want to leave her window perch and have to go back out into that crazy place. Mana picked her up and carried her out the door. It seemed to Archie that she didn’t have a choice. Mana, Azure and Skippy, along with Lunch and Archie sat at a table in Grundo’s Café watching a group play Gormball. Azure swatted at the occasional evil fuzzle that escaped Evil Fuzzles from Beyond the Star. “There really isn’t a whole lot of things to do here,” complained Azure. Archie looked up from under the table at Tiger, Moon, Chika, Flight, Mana, Azure and Skippy. What a crowd, she thought. Something caught the corner of Archie’s eye. Archie darted out from under the table with Lunch quickly following. Around the corner, past the Battle Arena, Splat-a-Sloth and Gormball towards a hole in the wall. A black and white tail disappeared behind a potted plant and through that hole. Archie could hear Lunch padding after her and the yells of Mana and Skippy for them to come back. Archie skidded past the hole, doubled back and ducked through it. Lunch, a bit more adept than most snow petpets, quickly followed Archie through the hole. Archie stopped short. Lunch skidded into her behind. They could hear the calls and see Mana’s hand through the hole. Lunch decided that he would remember how to get back to that hole. Archie got up and disappeared around a corner with Lunch following fast. “Archie, I don’t want to get lost,” muttered Lunch frantically. “Relax, you have a good memory,” Archie replied at complete ease. Archie and Lunch rounded a fourth corner into complete darkness. “Oh no! Now we’ve lost Archie and Lunch too!” cried Skippy, sinking onto his knees. The seven had followed Archie and Lunch’s footsteps all the way to the Hangar. Mana was getting worried. “Suppose they get lost and can’t come out,” whispered Tiger. “Then they will be lost like Hamish, Aquastripe, Isobel and Inkie,” retorted Flight. Flight’s comment made Chika burst into tears again. “What? More missing?” asked Mana. “Yeah, Isobel, my altachuck, Inkie the bloop and Aquastripe the kookith,” replied Moon. “I bet they will all come home. Or at least Archie will bring them home,” reassured Mana. “Who dares to trespass?” hissed a magtile. A snorlkin stepped out of the shadow behind the magtile. Archie immediately recognized the magtile as Spitz’s. Sharp. Even the name made her shiver. “Archie and Lunch,” said Lunch. “Did you hear that, Claw? Our lunch has arrived,” Sharp said mockingly. “Where is Hamish?” demanded Archie. “Oh, that biyako?” asked Claw. “Around here somewhere!” scoffed Sharp. “Okay, we’ll find him ourselves,” barked Archie. Lunch whimpered as more petpets surrounded him, some ghost, mutant, pirate and some just plain creepy. Archie charged into the pack of petpets. “Oh, little zomutt is fierce!” squealed one with delight. “Har har! They will never find those other trespassers!” called Sharp. “Other?” Archie whirled around to face Sharp. “Oh, the kookith, bloop and altachuck!” said Claw advancing on her. Archie whirled around, Lunch jumped on her back, and the two took off like lightning towards another corridor. The seven had gathered around the only square window in the Station, on the Hangar. “I hope Archie and Lunch get out of there soon,” said Mana hopefully. “Where did all of your petpets disappear?” asked Azure. Chika burst into tears for the third time that day. “The same place we saw Archie and Lunch go,” said Tiger. Flight rolled her eyes at Moon as she tried to calm Chika. “Shhh...” said Skippy. They all froze. Even Chika stopped crying. “What was that?” asked Flight. “ARCHIE!” cried Mana and Skippy. Archie kept whining. She heard Mana and Skippy. She knew that they had heard her. She was lost. She had lost Lunch in her plight. A kookith, an altachuck, a biyako and a bloop wandered around the corner out of the darkness. The four stared at Archie. Archie knew she looked frightful. She was a zomutt; if she wasn’t careful she could easily scare them away. The four still stared at her. “I’m Isobel,” said the altachuck. “My name is Aquastripe and this is Inkie,” said the kookith, motioning to the bloop. “And I’m Hamish,” said the biyako. “That’s a cute name!” said Isobel. More mews and barks could be heard inside the wall. “Hamish!” cried Chika, bursting into tears yet again. The seven were stumbling and bumbling over each other following the noises in the wall. Crowds of other Neopians stared at them as they ran. “Wait, this is a dead end down here,” said Mana. The noises in the wall got further and further away. Eventually the noises stopped altogether. “We’ve lost them... AGAIN,” Flight mumbled. Chika’s sobs got louder. “Flight! You’re just making Chika cry even harder!” reprimanded Moon. “I think we should head to the back to the place where all the petpets disappeared,” suggested Mana. “Okay, but I have to bring Chika back to the room, don’t count on me,” said Moon as she brushed off her skirt and linked arms with Chika. “I’ll go with you,” said Tiger as she linked her arm into Chika’s other. “See ya!” called Skippy. The four watched Moon, Tiger and Chika walk away. The mood seemed to dim. “I’ll head back too,” said Azure. Mana bit her lip and watched Azure leave in the other direction. “I guess we are all by ourselves now,” Flight said forlornly. Skippy sat down and leaned himself against a potted plant as if to take a nap. Mana looked at the clock nearby. It was 5:23pm. She hoped the petpets would come out soon. Isobel, Aquastripe, Inkie and Archie ran after Hamish as he ducked around corners and through cobwebs. Hamish came to such an abrupt halt that Archie and the other three piled up behind him. Archie threw herself in front of Isobel. “What are you doing!” Isobel asked in great confusion. Isobel seemed to understand. Aquastripe stood as far away from the light as she could without disappearing into the darkness. A small round black rock rolled into sight. They gasped. “Where’d it go?” asked Lunch. “Lunch! Great, we’ve found you!” Archie exclaimed. Flight squealed as a brown face with four ears and two different size eyes looked out of the hole straight at her. “A... a... ar... Archie?” Flight stuttered. “Oh, Archie!” cried Mana. Archie made her way out of the hole, followed by Lunch with one eye and Hamish, rolling Lunch’s eye with his paw out in front of him. Isobel and Aquastripe quickly followed with Inkie on their heels. Flight, Mana and Skippy started grabbing up the petpets. Skippy put Lunch’s eye back in. Aquastripe was cuddled by Flight fondly. Archie looked up from under that same table at Grundo’s Café. She watched Mana, Skippy, Azure, Moon, Flight, Tiger and Chika discussing how their petpets came back. “I’m glad I don’t have a petpet yet,” she heard Azure say. Archie turned and looked at Hamish and his three friends. She was glad to consider all of them her friends.